Stay in the heart of Lyngby, a charming town just 13 km from Copenhagen. Our hotel is located at the top of Lyngby shopping centre so you can't get any closer to the shops. You can park your car in the large underground car park below our hotel and walk to the nearest bus stop or train station. Stay at our bright and spacious hotel in Lyngby. All our 120 rooms are at least 34 sqm and are perfect for business trips and family holidays, as well as longer stays. Many of our rooms enjoy beautiful views of Lyngby and the surrounding parks. 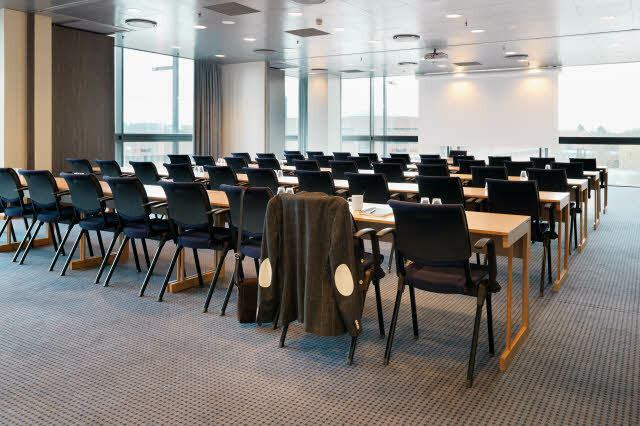 If you are looking for a conference hotel in Lyngby, hotel Scandic Eremitage offers 14 flexible meeting rooms that can accommodate up to 150 people. All our meeting rooms are, of course, furnished with modern IT equipment and free WiFi. Enjoy a delicious lunch or dinner at our restaurant Galleri with views of the Lyngby shopping centre. You can also relax with a drink or a hot cup of coffee in our cosy bar. Explore Lyngby or the surrounding countryside on one of our Scandic bicycles that you can borrow from our reception. When you stay with us, you can use the nearby fitness centre, within walking distance of our hotel, for free. Below our hotel is a large underground car park and we offer free parking if you stay at our hotel. Guests who are not staying at our hotel can park for a fee. You cannot get any closer to Lyngby's town centre! Scandic Eremitage is located at the top of Lyngby shopping centre and therefore an abundance of shopping opportunities is only a lift ride away from your room. A few metres from our hotel is the main street Lyngby Hovedgade, which also has a good selection of shops, good restaurants and cosy cafés. Our hotel in Lyngby is within walking distance of public transport and Copenhagen is 13 km away – a short train ride. Scandic Eremitage is also close to the attractions in North Zealand, such as the Louisiana Museum, Karen Blixen Museum and Bakken amusement park, so we are the obvious choice if you are looking for a hotel close to Cirkusrevyen theatre show. Keep fit in the local fitness centre when you stay with us. Our guests can use the fitness centre for free. Parking - arriving by car? We offer our overnight guests free parking in the underground car park below our hotel. Guests who do not stay overnight pay a small fee. You'll immediately feel right at home in our restaurant and bar at Scandic Eremitage, where you're sure to enjoy a great atmosphere. Both our restaurant and bar are decorated in a warm, Scandinavian design. Scandic Eremitage offers 14 top-modern meeting rooms of various sizes, with comfortable chairs, climate control, perfect acoustics as well as modern audio and video equipment.